This completely vegan lip balm is utterly creamy. Apricot and Jojoba hydrate and plump the lips, and candellila wax is a vegan alternative to beeswax that shields from the winter elements. 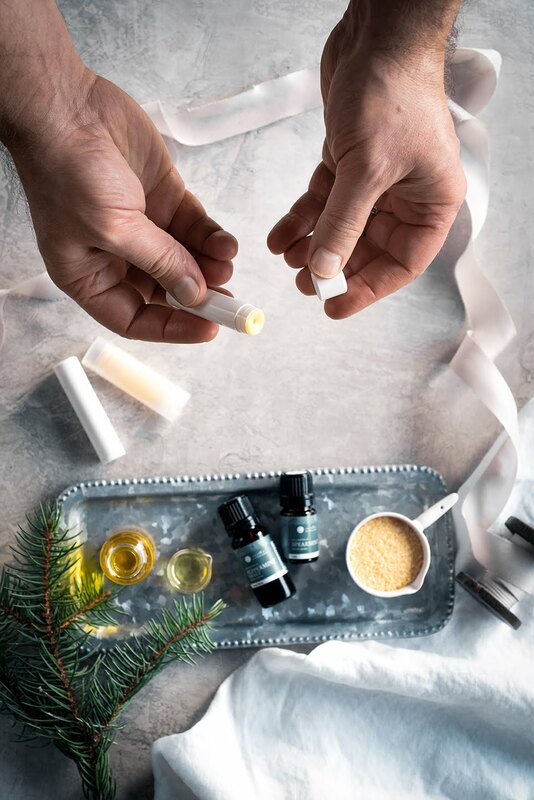 Flavoured with vanilla, spearmint, and peppermint, this festive balm is easy to craft and makes a sweet addition to holiday stockings. Melt apricot oil, jojoba, and candelillia wax in a double boiler. Allow wax to melt, taking care not to overheat. Once oils are thoroughly melted and incorporated, remove from heat and stir in flavouring, essential oils (and stevia if desired). Pour carefully into prepared lip balm tubes. It may be easier to transfer mixture to something with a spout, such as a liquid measuring cup, for easier pouring. Allow tubes to cool completely before capping, wiping away excess with a cloth or paper towel. We are a botanical apothecary, skincare boutique, and organic spa that celebrates everything that is natural and pure. Our shelves are stocked with beautiful toners, creams and serums, as well as dried herbs, essential oils, botanical butters and clays. At every turn, we seek to elegantly balance the efficacy of Science with the nourishment and art of Nature.